Europe and the Middle East: Divorce by mutual consent? IN THE FACE OF ASTONISHING DEVELOPMENTS in the neighbouring Middle East, Europe has been looking West of all places – to the U.S. – for cues on how to respond. Almost all European statements have echoed those made by the Obama administration, itself timidly playing catch-up with events it could not predict, comprehend or influence. It is about time Europe rediscovers the people on its borders, who will have an unprecedented say in policies to come. Alignment on the U.S. and its regional cronies simply has ceased to be an option. Europe and the Middle East, long wedded to each other by virtue of geography, commerce and culture — not to mention the crusades and colonialism –, have for several decades lived side by side, ever more estranged from one another. While the Middle East engaged in a tumultuous affair with the U.S., and began flirting with Asia, Europe hardly seemed to notice. Nor did the Middle East really care. In their day-to-day interaction, each side evokes to the other mostly unpleasant visions, all-but erasing a history of cross-fertilization. For Europeans, the Middle East had come to be almost entirely associated with endless and pointless conflict, insidious emigration, and terrorism. National nuances aside, the image of Europeans in the Middle East has been broadly shaped by EU policy, none of whose four basic tenets have had much resonance locally. The first is a massive albeit largely unnoticed economic presence, very technical in nature, lacking clear political objectives, and fragmented along bilateral lines. Tellingly, “regional integration,” a notion that enthrals governments and citizens alike in Iraq, Syria, Lebanon and beyond, was ushered in by Ankara, not Brussels. The second, third and fourth pillars are the topics that typically feature on the agenda of visiting EU delegations. The peace process has invariably topped the list, although it is an area where, through both its explicit statements and body language, the EU eschewed any role other than to publicly support U.S. policy even as it privately castigated it. Beyond bankrolling the Palestinian Authority and rebuilding infrastructure whenever it is destroyed, it has abdicated virtually all responsibilities. Embedded within the “Quartet,” which was designed chiefly to neutralise dissonant voices, the EU has tolerated that most critical decisions be taken discretionarily in Washington. Thus the single most prominent political issue raised by Europeans was one that seriously sapped their credibility. Next came a half-hearted promotion of democracy, hindered by reliance on illiberal ruling elites and defiance of society at large, for fear of empowering Islamists – thus a policy of double-standards on both polls (according to results) and repression (depending on who is the victim), and Europe’s ambivalent reaction to the Tunisian an Egyptian uprisings. Finally, terrorism in the Middle East and abroad has all too often been apprehended as a form of violence purportedly inherent to Islam and Islamism, eschewing more fundamental drivers of conflict: occupation, historical injustice, dysfunctional political systems, social alienation, and so forth. A patronizing conception of local culture as the source of all ills has deeply alienated the EU from the Middle East. It is troubling that, centuries of interaction notwithstanding, Europe would look at the Middle East increasingly through American eyes, as if it had no value-added or interests of its own. Even setting aside resent events, the specific challenges it faces are daunting. Does the EU not feel the urge to rationalise (and not simply contain) migration patterns? To reduce the impact of Mideast conflicts on domestic Muslim constituencies? To secure access to key markets? And, more generally, to remain competitive in an arena where the new global balance of forces is playing out, and where Europe — precisely due to its proximity, history and collective economic leverage — theoretically has an advantage? At best, when they do not toe an American line, Europeans merely compete among themselves, often on the basis of trivial considerations, and to their mutual detriment. If seeking a European consensus may prove elusive, member states could at least articulate their differences, banding together in smaller, issues-based, informal groupings, distributing roles and seeking synergies within a certain overarching strategic vision. What is most urgent today is to realise that the political upheavals under way will lift the lid on public opinion in the Middle East. This doesn’t necessarily mean a shift toward more extremism. But what is clear is that the West cannot continue to count on the suppression of popular feelings to diminish the price tag of indecisive, if not insincere, policies. A festering Arab-Israeli conflict in particular, sustainable under prior circumstances, may become far more volatile and costly to the West. This places Europe and the U.S. in front of a dilemma. They can attempt to save what can be of the status quo, and assume a regressive role in a region that clearly wants to look forward; the risks are high of being overtaken by history. Or they could step up their efforts to make a difference in the one area where people of the region have been waiting for decades for the West to take its responsibilities, namely to convince Israel that there are concessions to be made to consolidate its legitimate place in the Middle East. The argument according to which the U.S. must take the lead in this respect, because it carries more weight with its Israeli ally, has been eroded by the Obama administration’s inability to exert any pressure what so ever. It is now up to the Europeans to blaze the trail, because they enjoy more freedom to act, and because they should feel more directly concerned by the fate of their neighbours. 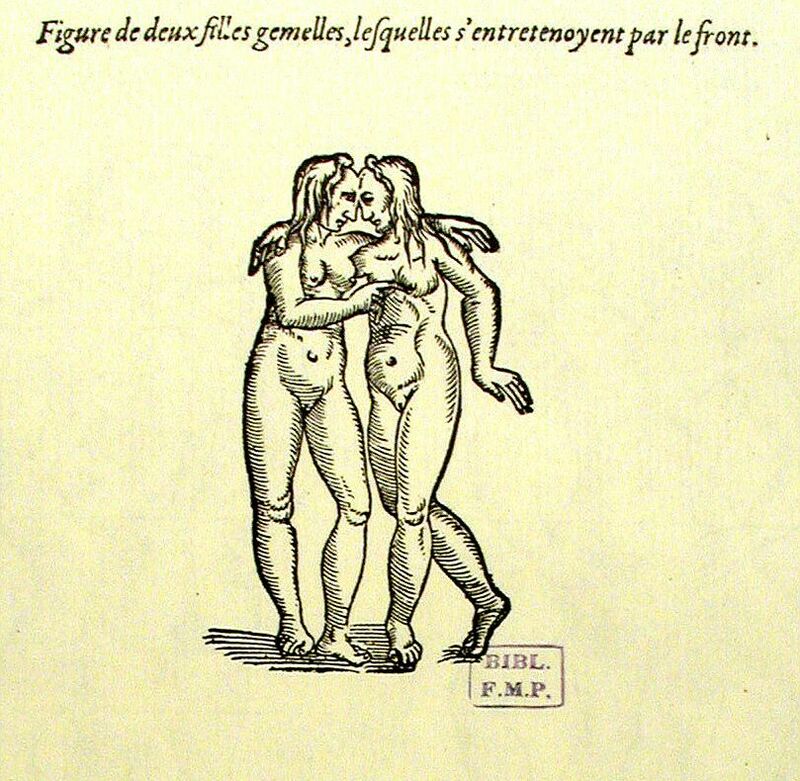 Illustration credit: Ambroise Pare Deux filles gemelles, lesquelles s’entretenoyent par le front by Paris Descartes / licensed by CC.